Are you a victim of car burglary or vandalism? What do you do? Who do you call? Being a victim of any sort of theft or burglary is a very unsettling and confusing. Maybe you left your windows down. Maybe you did everything right, yet you still couldn’t deter a burglar from doing harm. No matter what the scenario, theft and vandalism is a crime and should always be reported to the police and your insurance company. 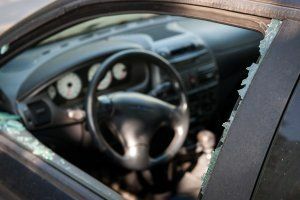 This month, the auto-glass service and window-repair experts at Three Rivers Auto Glass is sharing a few tips on preventing theft and what you should do if you’ve been an unfortunate victim. Before you set off for work, you stop at a gas-station for gas and gum. You get out of the car, think to yourself, “I’ll be 2 minutes”. You run into the store, put $20 towards the gas and the gum, return to your car, and as you begin to pump the gas you notice your laptop is missing. You think, “Did I leave it at home? Did it fall behind my seat? Did I put it in my trunk”? No, you forgot to lock your car door and in minutes someone just stole your laptop – your companies laptop – nonetheless. What would have taken seconds to lock your door turned into a day of contacting the police, your insurance company and your boss about the break-in. When exiting your vehicle, always lock your car doors – no matter how quick you think you’ll be! Out of sight. Out of mind. While it sounds cliché, it’s something most of us simply forget to do. With an influx in cell phones, laptops and kids electronic devices, it’s hard to remember to stow everything away before you exit your vehicle. However, just one of these items can range from $100 to over $1000. Big-ticket items are prime targets for a potential thief looking to cash in on something quick. Be sure to find a hidden place within your vehicle to keep these items out of sight. Whether you’re off to work or going out for the evening, parking your car in a well-lit, busy parking lot, or on a busy street, may be the difference between your car getting broken into, or not. Burglars tend to lurk in darker, less-populated areas that aren’t jam-packed with traffic and other public activity. Parking somewhere that’s off the beaten path not only puts your vehicle at risk for burglary, but you too could be in danger. Always park in a safe place! If you think losing a personal item from your car is unsettling, think about having your house keys or garage door opener stolen. While we don’t want to scare you, you have to consider that right within your vehicle’s glovebox might be your personal address information (car registrations etc). If someone breaks into your car and sees a set of keys or an opener to your home, they now know where you live. If they didn’t get much out of your vehicle, they may target your home. Never leave these items or anything too personal, including information like the names of your children, in your car. Call the Police. Don’t’ touch, drive or move anything until the scene of the crime is thoroughly documented. Be able to provide your license, registration and insurance – that’s of course unless the items were stolen. Take photos. Be your own advocate. Take pictures before you clean-up any mess and make a list of thing damaged and items stolen. Cancel credit or debit cards – IMMEDIATELY. If they’ve already been used, contact the financial institution for more information on where any unauthorized transaction took place as it could lead you to more information on the crook. submit a claim through your renter’s or homeowners insurance. CALL THREE RIVERS AUTO GLASS: At Three Rivers Auto Glass we will deal directly with your insurance company and fix all of your auto-glass issues. Don’t hesitate! Call us at one of our six Greater Pittsburgh locations! ← What to do With a Leaking Windshield?